Nokia has released a new firmware update for Nokia C3-00 device. This update brings a new web browser, a faster charging, camera performance and also brings general performance and usability. This new 08.63 software update introduces the Ovi Browser as an alternative browser. The charging time of a partially charged battery has been reduced by up to 30%, and camera performance in low light conditions has been improved. If you want to get this software through your device, type in *#0000# on the home screen or go to Device Manager. Select Options > Check for updates and follow the on-screen prompts. Alternatively, this software release is available through the Nokia Ovi Suite. 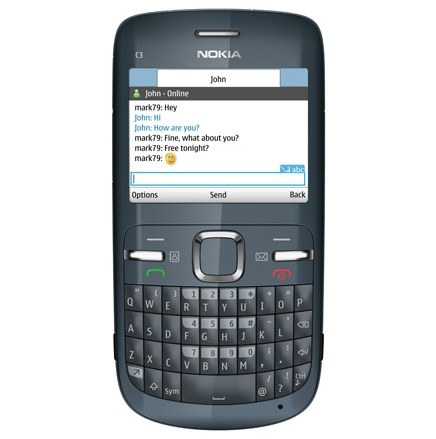 As a reminder, Nokia C3-00 is an QWERTY device with 2.4 inch screen with 320 x 240 pixels resolution, 64 MB of RAM, 128 MB of ROM, Wi-Fi b/g, 2.0 megapixels camera. C3-00 has social network integration and flash lite support.